We, at VFV, have always been so thankful to have dedicated and passionate volunteers who would always lend us a helping hand and support us with our advocacies. 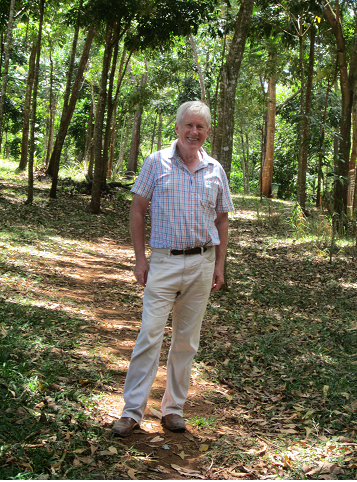 Sir David Worth, a happily-retired Civil Engineer from the UK, makes a perfect example of a volunteer of that sort. In the written interview below, he is going to take us to his volunteering journey with VFV, and in the process, would prove to us once more that volunteering is for everyone, with age being not much of a factor. Indeed, there’s always a “David” inside all of us that will conquer the “Goliath” in whatever we want to do in our lives. Sir David shows us how he just did. I would describe myself as a creative professional. That is, I have been fortunate to have a good academic education and have greatly expanded on that through life experiences – both within my career as a civil engineer and by being adventurous. As a professional, I remember what I have learned and am able to use that knowledge in new situations. Thus I am not afraid of new situations. As a professional I am diligent, hard-working and honest. As a creative person I find that interesting ways of presenting just come into my mind. 2. What might we be surprised to know about you? Well, you know I am a professional civil engineer and so I have a practical and realistic outlook in life; also that with my engineering, I have lived and worked for years in Africa, the Middle East, Borneo and Australia, so I am comfortable with being away from the UK in warm places. You know also that I have been much involved in drama and other forms of on-stage entertainment. You know I have been on adventurous treks, such as to Machu Pichu in Peru. But there is one common activity at which I am useless ….. any form of sport !! Swimming, running, kicking or hitting a ball (even a snooker ball) …. I cannot do. 3. How long have you been volunteering? My first period of volunteering was early in 2013, so before Yolanda. I think I came for five weeks that time. 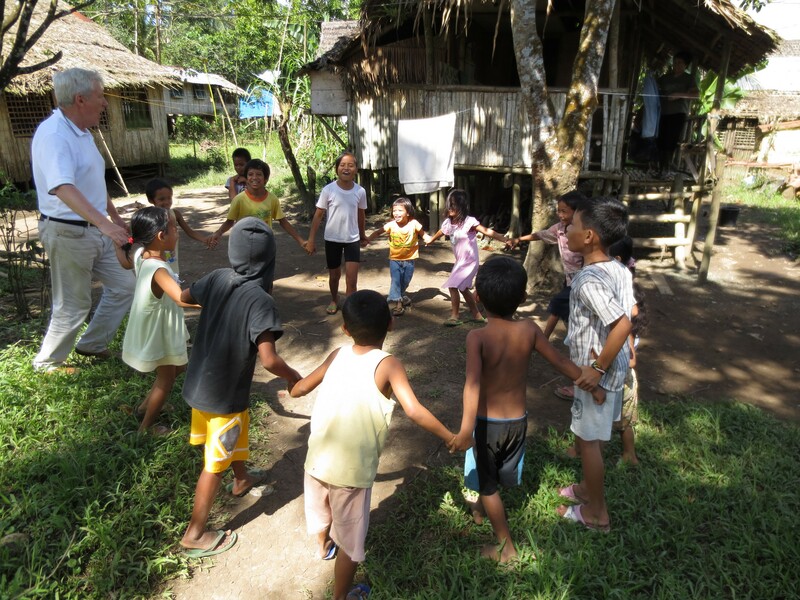 Each period of volunteering has been as a teacher in a rural Elementary School, either Mohon or Cangumbang. Since the first time, I have come every year (2014 to 2018) from the end of January to March/April. So six times a volunteer. Latterly, I have stayed until just after the end of the school year so I can share the pupils’ pleasure in the recognition / graduation ceremonies. 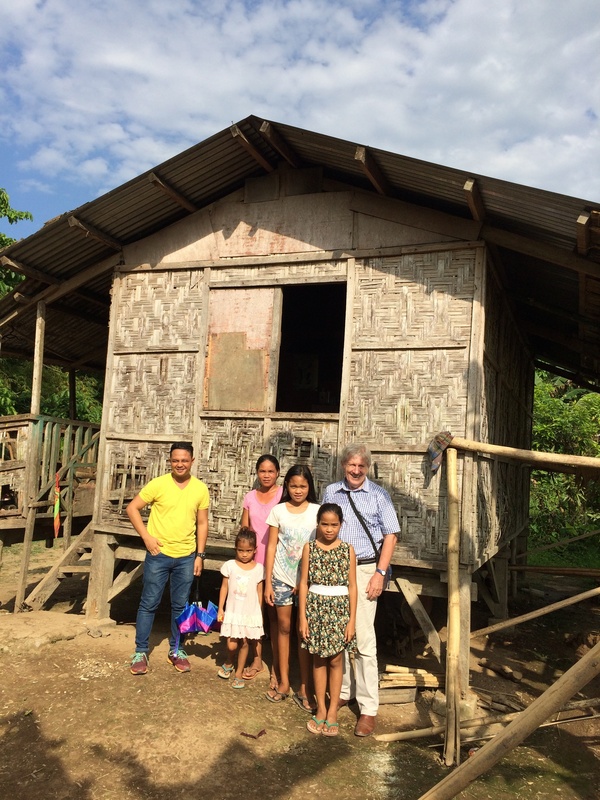 The volunteering early in 2014 was not long after the Yolanda disaster so I saw the destruction to lives, homes and livelihoods – a sobering experience that pictures on TV cannot convey. With Caroline and the children on a walk-about behind Mohon. 4. If you weren’t volunteering, what would you be doing instead, or what would your life be like? When I am not in the Philippines my main activity is taking care of family life, in particular, taking care of my wife, Caroline. She is still in paid employment whereas I am retired, so I am known as “the house elf” who deals with many of the household chores. Beyond that – I volunteer !! I am a voluntary Trustee of a regional church charity, involved in administrative, legal and financial matters and with particular responsibility for overseeing maintenance of our properties (because I am an engineer). Earlier I had volunteered as a leader at our local Boy Scout Group and as an assessor of candidates applying for professional engineer status. I am also an occasional speaker at functions. 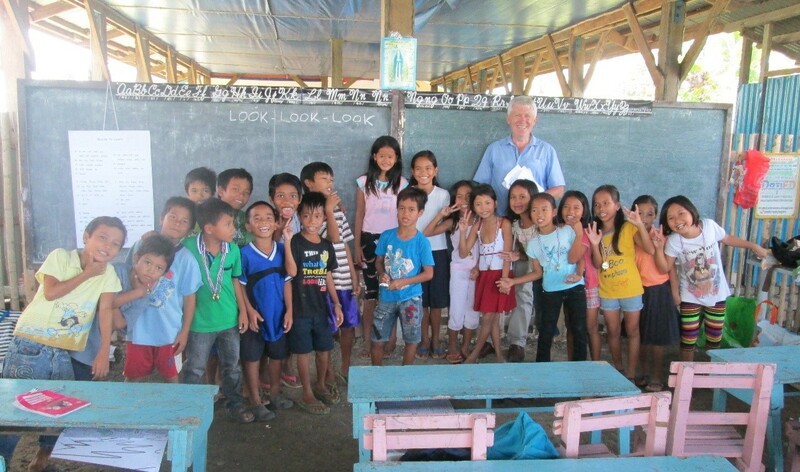 My illustrated talk about volunteering in the Philippines is always well-received; I have other talks too. Being with VFV for a few months means I am absent from those other tasks. But having the time with VFV is invigorating. I feel it helps keep me alert and active, thus better able to do things back home. My life would lose some “spark” if I was not able to come to the Philippines with VFV. 5. Can you tell me how you first got involved with VFV? In my working life I always envisaged doing voluntary work overseas (i.e. outside the UK) after I retired. This outlook was particularly strengthened through my time working in a very poor area of Northern Nigeria. I felt that as long as I had the health to be a volunteer I could use my wide-ranging skills to help disadvantaged people. I always intended this to be in the tropics, as I like the warm climate (much preferable to the chill of the UK). As a retirement gift, the company I worked for gave me money for a vacation. I would go in April / May and I saw the Philippines had pretty much rain-free weather at that time, so I went there …. knowing really nothing about the country beforehand. I was immediately struck by the welcoming friendliness of the people, by the wonderful natural surroundings, by the historical features, by the fact that one could travel around without too much difficulty (though with an adventurous feel), by the fact that things (coffee, cold beer, Jollibee and other vacation essentials) are available (with a bit of looking) and that English is widely used. 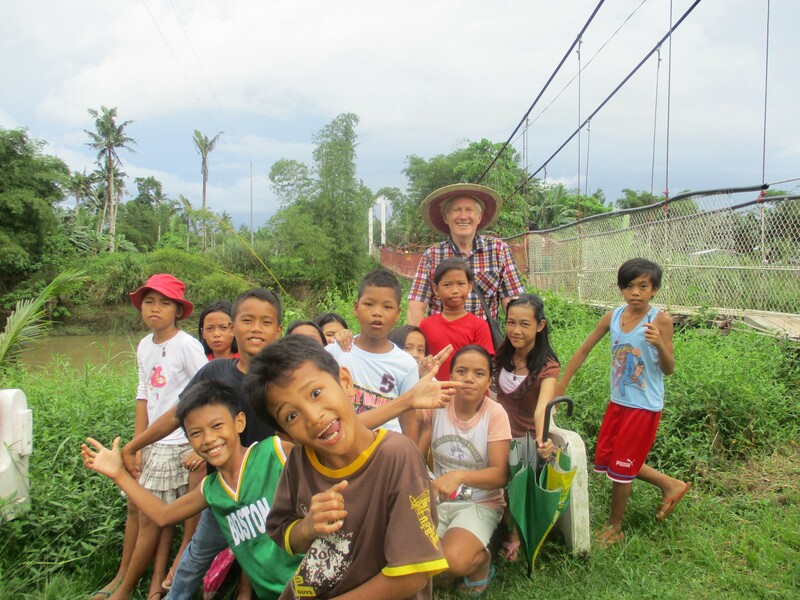 At once I decided my volunteering should be in the Philippines. Next was a look on the internet. There are many websites offering places for volunteering in the Philippines. I soon realised that many were “upfront” organisations rather than real “on the ground” ones. I also realised that many led to VFV. So I looked instead at the VFV website – aiming to go direct rather than via an intermediary (I had seen how intermediaries in the UK advertising adventures to High School pupils were a “rip-off”). The VFV website made very clear what volunteering projects were available, showed clearly beneficial objectives for the projects, had past volunteer comments to support this, and showed VFV as an “honest” organisation – truly focused on giving benefit in the community rather than being interested in grandiose offices / politicking and the like. My enquiries were handled speedily and helpfully. So I came. VFV turned out to be as good as I’d hoped, so I have come again and again. 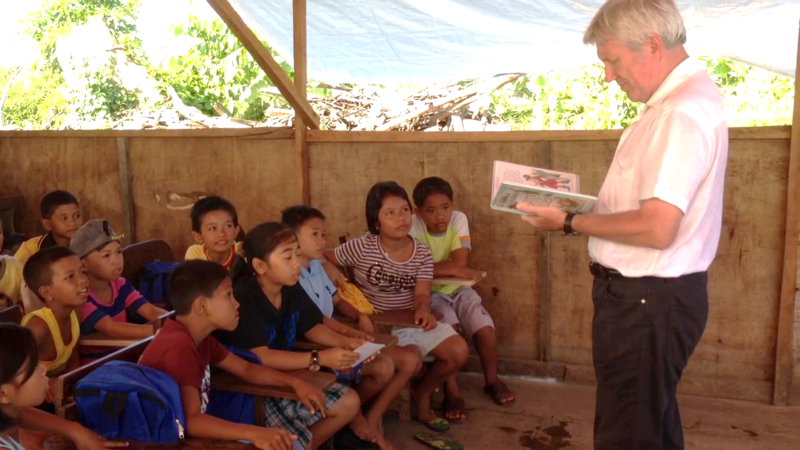 Reading a story to the 4th graders in a wooden temporary classroom they used in Mohon after supertyphoon Yolanda. 6. What is your first memory of volunteering with VFV / your project? What was your first impression of your project? My first memory is the most friendly welcome, from Ester and others at the VFV centre then from Sir Sebastian and other teachers at Mohon Elementary School. I was immediately put at ease with a realisation that my presence was not an intrusion but was appreciated and welcomed. My first impression of my project (the first time at Mohon Elementary School) was “these children are just like children in England”. I saw the girls behaved just as girls at home .. they smile, they like to please, they like chatting, they like playing with their hair; and the boys are just like boys at home …. they are sullen, they are lazy but will work well enough if prodded, they like play fighting and like sports. I knew immediately that I could cope. 7. What has surprised you most about working with your project? I was a little surprised, but delighted, at the autonomy I was given in how I conducted my project. At my (senior) age I am used to being the boss and being the one who directs what will happen (I did this in my UK drama work also) so it was pleasing to find I was allowed to run the lessons how I liked ….. though of course I was mindful of the curriculum needs as a framework. 8. What is it like to be a volunteer / donor? How does that make you feel? This may seem like vanity, but in my involvement with people I meet because of volunteering with VFV, I feel like I have a special status. So many people at the schools, in the school barangays and in / around Bliss give me a warm welcome and greeting every time I see them. For example, the man at the photo printing store in Robinson’s mall immediately said “Welcome back, Sir David” when I went there in February having been away many months. The pupils in the school (not just in the Grade I am teaching) follow me around and ask me to visit their house. In class, most seem to relish the way I teach, as a difference from the way they are used to experiencing. I feel too that most appreciate they are getting something extra, meaning not just that I give them pencils etc., but they are getting a fresh (to them) outlook. 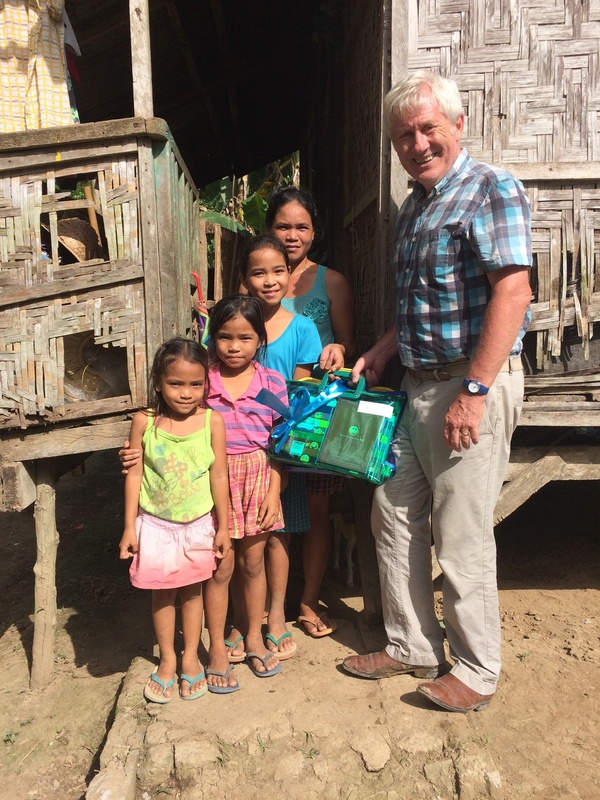 David, giving school supplies to a family in Cangumbang. As a donor (of items, never money) to some families and individuals in the school barangays, I feel also that the recipients are truly thankful, not thinking “he’s foreign so he must be rich, so he will give us things”. So it’s nice to feel that volunteering is being helpful and is appreciated. 9. What’s the best / worst thing to happen since you started working with VFV / your project? The best thing to happen is when I found I was so warmly greeted everywhere I went – “Hello, Sir David. Good morning” and like that. It was, and is, a wonderful experience. Sorry, I am crying again too as I write this. 10. What do you find most challenging about your project? The most challenging thing about my project at the school is wholly self-inflicted. As a professional in my working life, I like to be well-prepared for what I do, have a “Plan B” if things don’t go as I expected, and for what I do to be truly useful. So for the teaching I always intend that the pupils learn something in each lesson and that they get some new but informative experiences – so “proper” lessons not just playing games. Getting ready each day for this to happen means, for me, a lot of preparation – creating a detailed plan for each lesson period and creating / printing associated worksheets or story pages for the pupils to use. The big challenge is this preparation. The reward when the outcome is a true learning experience for the pupils makes it all worthwhile. 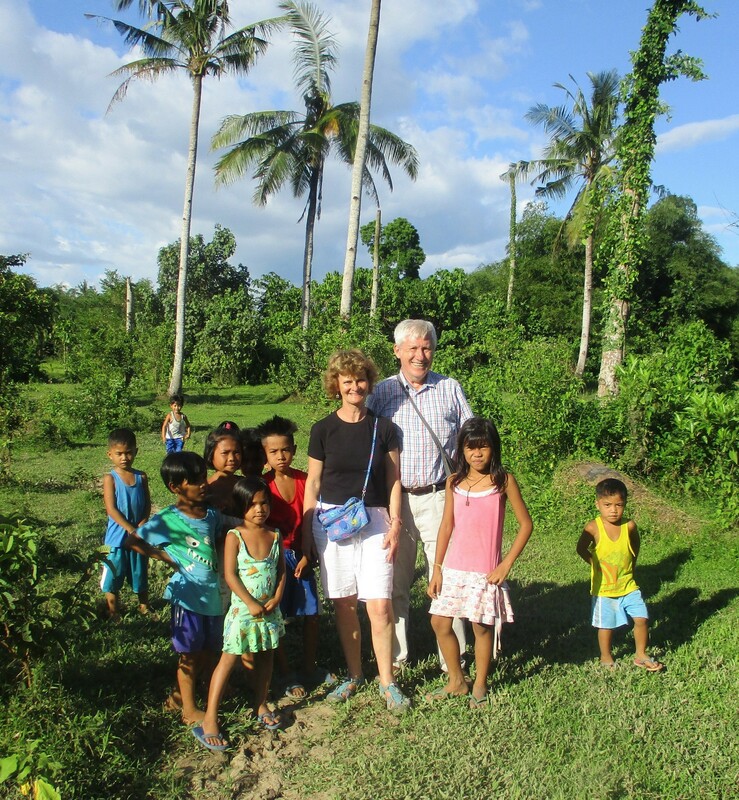 David’s first visit to Cangumbang, before the VFV centre was built, teaching children how to do the “hokey-cokey”. 11. What do you wish other people knew about VFV/your project? I wish people could appreciate the honesty of VFV compared to that of many other apparently charitable organisations offering volunteer opportunities. I see VFV as genuine, in that money paid for volunteering enables the infrastructure (staff, office, etc.) to exist but otherwise goes to support projects – it is not diverted to people’s pockets or wasted on politicking / grand promises / grand advertising and the like. Similarly, the projects target a genuine local need aiming to make a difference for the long term (not transient trivia) and have success at this. Regrettably, there are many apparently attractive opportunities advertised where in reality much of the money one pays is diverted away from the stated aid activities they advertise; in addition, the aid activities are sometimes for a manufactured need rather than real need – preying on a Western middle-class desire to “be seen to be doing good”, but without really understanding the life conditions. 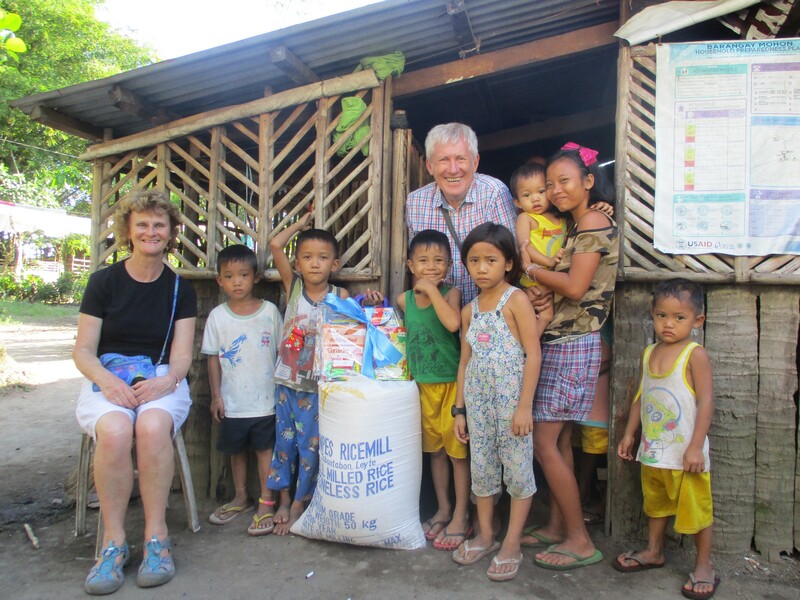 David and Caroline, giving rice and school supplies to a family in Mohon. 12. Tell me about someone who has influenced your decision to initiate your project or work with VFV? The most influential person is my wife, Caroline. I met her when I was working in a remote part of Northern Nigeria. She was a teacher at a High School in the village near to the construction camp where I lived. She was there by arrangement of the UK government organisation Voluntary Service Overseas (VSO), having applied to do voluntary work after finishing at university. We met, got on really well together, and got married – our first year of married life being still out in Nigeria working as before. Through the local network of VSO volunteers, I got to appreciate how helpful this form of aid work can be, as well as it being inwardly rewarding for the volunteers themselves. I am fortunate that Caroline and I share the same values in life. So when I said I would like to volunteer in the Philippines, she was supportive, not angry at being left at home alone for a while. As you know, she has much enjoyed visiting Tacloban and the schools / barangays and getting to know the people there. Relaxing with other volunteers. 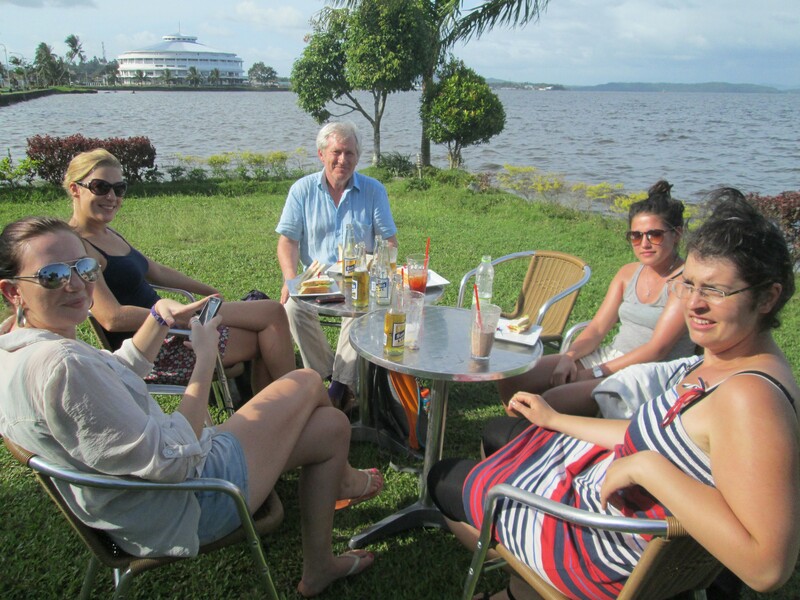 Volunteers do have time to relax and it is fortunate that Café Lucia, with its nice waterfront setting, is so close to Bliss where David’s homestay is located. 13. Can you tell us about some of the people you’ve met while working on your project with VFV? Top of the list are Ester and all of you at VFV. You have always been wonderful to me. Thank you. Next up must be Sir Sebastian at Mohon Elementary School. He is so friendly and helpful, my guardian angel while I was at Mohon. He was helpful not only in school but in getting me to know Mohon, its surrounding areas and the families there, being happy to walk with me to see all these places and people. He was also a great support in helping me distribute personal aid (rice, school supplies, house building materials) to families at Mohon. And such a cheerful fellow. He opened up Mohon for me so it now feels like home. David, visiting a pupil’s home. The man in yellow is Sir Warren. At Cangumbang, this year my mentor was Sir Warren. He too was keen to help me, not just at the school but in getting to see families in the barangay. Drawbacks were that he does not live there, so is not so familiar with the place, and he had not so much time to give me as he was busy with school work / administration. But I thank him for helping me get to know Cangumbang. Teaching is obviously my main volunteer activity. But I think of it as a way of getting to know the families there so I can see how life is for them and can select some to whom I will give personal aid. In this, the pupils have been a great help. They love the attention I give them and enjoy the novelty of walking around with a foreigner. Some pupils have been particularly willing to show me around and help me know about where they live. At Mohon I think particularly of: Mary Jane Campo (soon to be Grade 9), Jasmine (soon to be Grade 8), Christine Joy (soon to be Grade 7) and Blitzelle (daughter of the barangay captain). At Cangumbang I think particularly of some from my Grade 5 class this year: Lowella, Keziah Mae and Raizel (VFV sponsored). All the pupils have made volunteering a joyous activity. A very important person I have met is Nanay Virgie, my recent homestay mother. She has looked after me very well, making sure I am properly fed and kept healthy for my stay in Bliss. She also keeps me informed about what is going on locally. The house is often full of her family members but she kindly ensures that they do not become too noisy or intrude into my need for space and quiet in which to prepare for school. She has been very helpful and caring. Some others who have made living in Bliss a joy are those in some of the stores: Mark in the laundry, the man in the Blissful store opposite the VFV arch and the man (and his lady assistant) at a photo printing store in Robinson’s mall. All immediately welcomed me with “Welcome back, Sir David. Good to see you again” when I returned for my next period in the Philippines. Walk-about to the hanging bridge in Mohon with the children. 14. When your friends / family find out that you run volunteer projects with the kids here in Tacloban, what do they say or ask? Most of them say “Oh, David, you are so brave. And at your age too ! !” They say this because they have no experience of being in a country like the Philippines; their experience outside the UK is only of resort places or the USA. They ask how do I cope with the heat, the food, the language, the cockroaches and with being so far from home. On the last point I can reply to them that Tacloban and the school barangays are “home” because I know so many people there and I am so welcomed everywhere I go (more so than in the UK for sure). 14. What would you say are some of your strongest beliefs about your cause / project? My long-standing philosophy is “help those in need if one can”. I couple that with a view that one should help even if the help does not solve everything for the person in need. I use the phrase “in the darkness even a small candle gives some light”. Even a little help is useful; don’t stop just because one can’t cure all ills. Also I believe my efforts in teaching, and in the out of classroom experiences, have been truly beneficial to many of the pupils. It has been very flattering to visit some of their homes and find hung on the wall, photographs I have given them of participation in various activities … even photographs of my family at home (photos I had given out to illustrate some aspect of a lesson). I hope the pupils can carry the learning with them into their future school career. 15. What else can you tell me about your project? Over the different periods of volunteering, I have taught English and Mathematics to Grades 3,4,5 and 6. These subjects are core skills from my career as an engineer. Being an engineer, I naturally make the lessons practical and creative – not dull and dry from a text book. I found all the pupils loved my dramatic story-telling (here using my acting skills) and fell with enthusiasm into the drama enactments I often used as a development from the stories. I found it interesting that the stories were liked even though they were almost wholly European fairy tales rather than Filipino stories. I always had a store of basic school supplies (paper, pencils, sharpeners etc) kept in the classroom for loan on the day to any pupil who needed them. I soon observed that pupils preferred to borrow a pencil from me than use their own one (claiming they didn’t have one – but I know they did really). I went along with that because it made them happy. Pupils would eagerly volunteer to give out and collect items I was lending. I insisted on polite requesting: “Please, Sir, may I borrow a pencil?” and “Thank you” when I gave one. Other teachers were surprised and impressed when hearing this polite behaviour. Every week I had at least one, sometimes two, sets of classroom work which I collected and marked at home in Bliss. These scores, together with those from my end-of-session summary test, I used to grade the pupils. I gave my assessment to the contact teacher. I also used the grades as the basis for in-class medal awards and some prizes. I also gave awards for good attendance and for good behaviour. 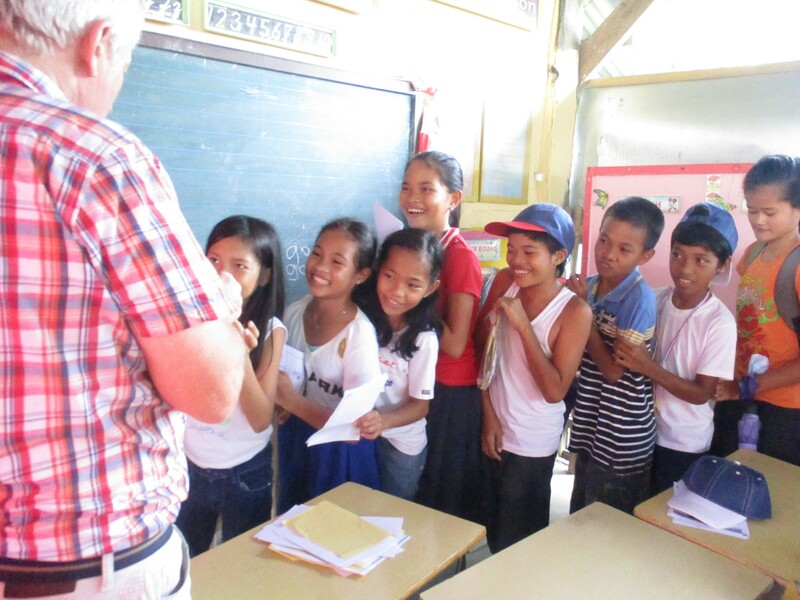 Opportunities arose, both in class and on walk-arounds in the barangay, to take photos of the pupils. I then got copies printed in the mall and gave them to the respective pupils. They loved this. I have seen in some pupils’ homes photos on the wall from my past teaching periods, kept as remembrance. 16. What would you tell someone who is thinking about volunteering, donating or working for your cause? On volunteering, do it. Do not be afraid. Do not think you are too old. Just bring your initiative and knowledge to help people in need. These are people who are poor because of their situation, not because they are lazy. Help these children get out of their poor situation by giving them food, health care, education and individual attention – all things we in developed countries take for granted but which are things not readily available to poor people in the Philippines. You will feel a huge inner reward as you see how much your help is genuinely appreciated and is within a long-term program of support, not a “do today, forgotten tomorrow” business. The Philippines is an easy place to be in, so come, join in, make a difference. On donating I say trust VFV. They are honest. They do good work with a long-term program of support to poor children and families so eventually these people can get out of their poverty trap. It is achievable. Trust VFV with your money. It will not be squandered on glitzy offices and the many other wasteful trappings one sees with many major aid organisations; it will be used wisely for direct benefit to those in need. VFV staff are out there “on the ground” and know where help will be most effective. Over six years I have seen the benefits realised. Support them. 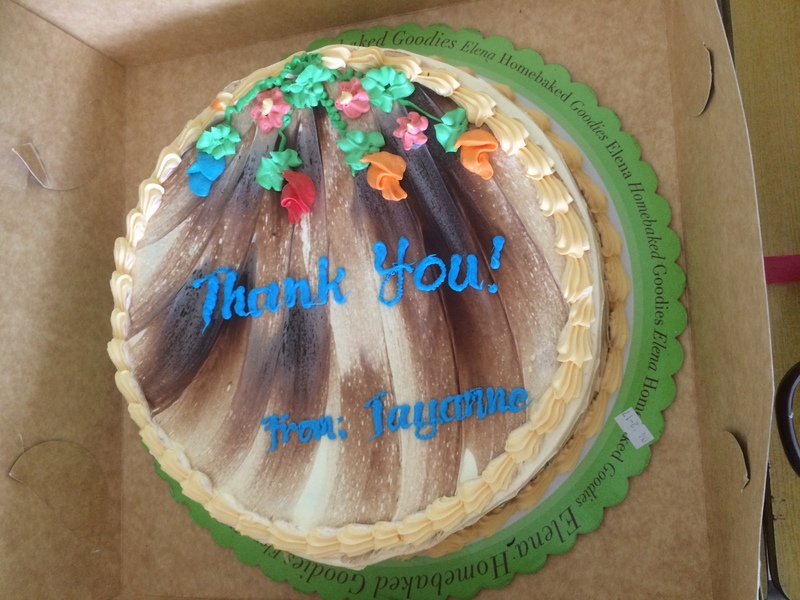 A “Thank you” cake from a parent of one of David’s pupils. It shows that volunteers are appreciated in the community. Keep up the good work – making a difference, a real difference for the good of those in need, no matter how small. Even a small benefit helps. Thank you for letting me a part of it, letting me contribute to helping in my “new home”.